The practical modular design saves valuable servicing time. All major pump components are secured by stainless locking rivets, allowing the units to be disassembled quickly without tools and can easily be converted to other models. The peristaltic pumping action eliminates down time from prime loss due to off-gassing solutions and eliminates the need for troublesome degassing valves. Simple periodic tube replacement minimizes down time and maintenance costs. All that is required is setting the tube in place and guiding it as it threads itself into position. No lubrication is required. The feed rate control in the Classic series allows the pump’s output to be scaled from 5% to 100% with the simple turn of the external dial ring. 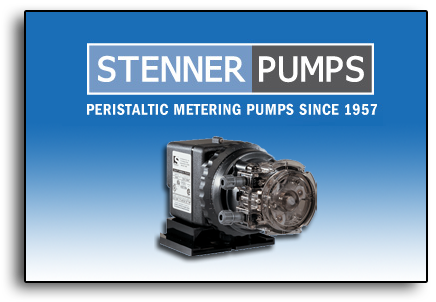 Stenner manufactures a peristaltic metering pump that operates reliably against 100 psi. Various solutions and chemicals can be metered without harm to the unit because they are pumped without exposure to air or the moving mechanical parts. Hydraulic fluids are not used and therefore can not leak into the solutions metered. The snap-fit modular design allows easy conversion to another model providing customers with flexibility for various applications.